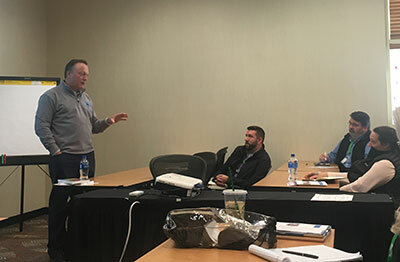 Aspire held its inaugural User Conference in Phoenix Feb. 6-8. The conference aimed to help clients better use the software and technology in order to run their businesses more efficiently with presentations from industry experts and group activities. The event saw close to 200 attendees, all of whom were Aspire users; some of them new and some of them old. Many companies in attendance had only just begun using the software in the last couple of months, while others had been using it since it was launched five years ago. No matter how long a company had been using the software, the goal of the event was simple: bring clients together to talk with other clients, ask questions and hear from industry leaders on how they put technology to work in their companies. Technology — whether it’s software like Aspire or hardware like an iPhone — can help companies streamline their processes and make them more efficient. It can also lead to more growth and more profit, according to Greg Herring, consultant and CEO of The Herring Group. However, many people find new technology intimidating and are reluctant to use it in their businesses. According to Kehoe, one way to mitigate some of those fears is to educate users on how to properly use the technology. The educational aspect was not lost on the attendees. Many of them came to the event to learn the practices of the presenters from the industry, as well as to learn from their peers. “My goal in coming was to find out how other people are doing it,” said Justin VanBlaricom, CFO at Greenscape in Raleigh, N.C. VanBlaricom was recently appointed CFO of Greenscape and wanted to get a sense of how he could make the most of the software for his company. Other attendees came to get verification. “(We want to) make sure we’re using it like it should be used,” said Brenda Hampton, controller at Signature Landscape, Kansas City, Mo. 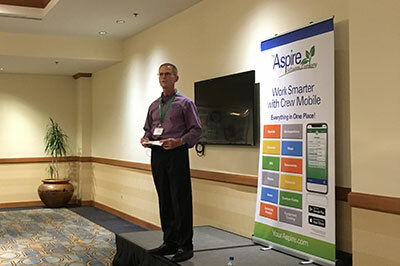 Adam Flint, branch manager at Pacific Landscape Management, Portland, Ore., said he and other members of his team came to the event to learn as much as they could about Aspire’s new releases so the company can implement them effectively and get the most out of them. Many attendees also got the opportunity to give feedback on the software and discuss in groups their best practices for using it. A “Cocktails with Champions” session gave those in attendance the opportunity to chat with the various speakers at the event on topics such as peer groups and GPS tracking systems. Kehoe hopes to keep the event going and have more attendees next year. He also has ambitions to bring technology to lawn care providers on a larger scale.